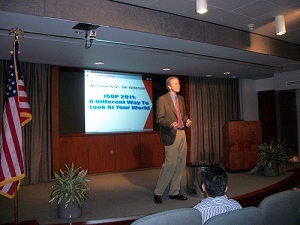 On Wednesday, February 2nd, 2011, Dr. Jim Anderson delivered a keynote address to a Verizon IT management training class. The purpose of Dr. Anderson’s speech was to share with the audience just exactly what they were signing themselves up for while they were enrolled in the 9-month training program. Most of the students had no idea what they were going to get out of the class before Dr. Anderson took the stage. During his speech, Dr. Anderson shared with the class the importance of having a 5-year career plan. He pointed out that all too often IT professionals just let events unfold and find their careers taking them downstream with no particular destination in mind. A key point that he made was that the students had the power to seize control of their careers and direct where they want them to go. Dr. Anderson pointed out that with the looming mass retirement of the Baby Boomer generation, the profession of IT doesn’t really need more workers, what it needs is more IT leaders. Using stories from his 25-year career, Dr. Anderson drove his key points home. IT managers are able to get more done if they can get their staff to work together in teams. However, this is never as easy to do as it may seem. He got many laughs from the audience as he related stories of IT teams that he’s been a part of that have struggled to accomplish tasks in the middle of companies that didn’t know how to use teams. Dr. Anderson finished his presentation by challenging the team use their time in the class to try new things. Yes, they should expect to fail. However, this program is the place to fail. He pointed out that they’ll be surrounded by fellow classmates who will step in, help them up, and let them try, try again until they succeed! Contact Blue Elephant Consulting to get the assistance that your IT managers need in order to become successful managers who can lead and motivate teams in order to achieve maximize everyone’s potential.